Random Sides // Mise En Place. A little Sunday food for thought: mise en place. “The system that makes kitchens go is called mise-en-place, or, literally, “put in place.” It’s a French phrase that means to gather and arrange the ingredients and tools needed for cooking.” – Article via NPR. Mise en place. Have you heard of that phrase? It’s a French one, as all “fancy” [to we English-speaking folk] food-related phrases are. As aforementioned, it simply means to organize all of your ingredients and tools needed for cooking and baking. I learned of the phrase about a year ago. 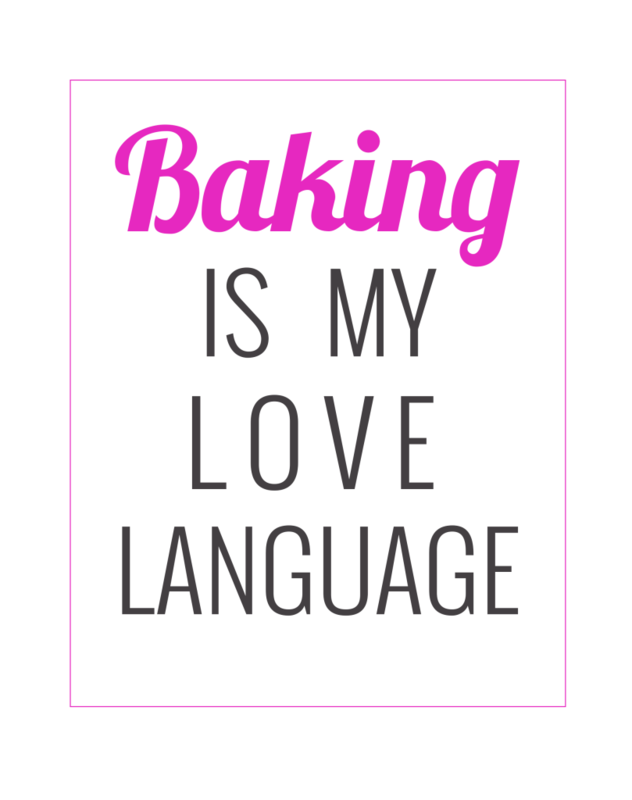 It’s a simple concept, but one that sticks with me as I continue onward in my baking and cooking adventures. The phrase reminds me to put everything in its place, to read and re-read recipes to ensure correct comprehension of them, and to be fairly organized before I begin. Mise en place saves me a lot of headaches and mistakes, that’s for sure. 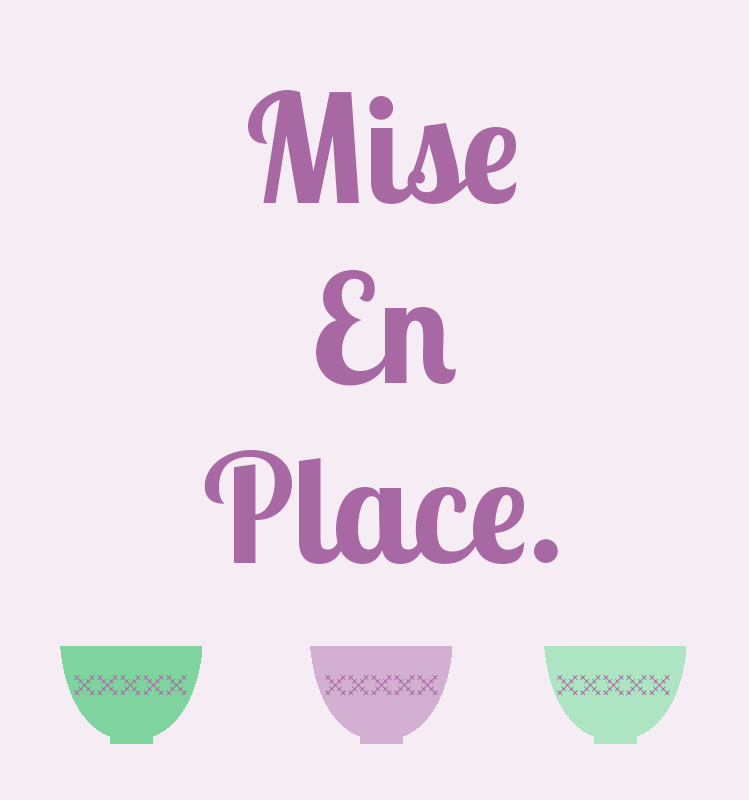 Do you practice mise en place? Do you find it useful? 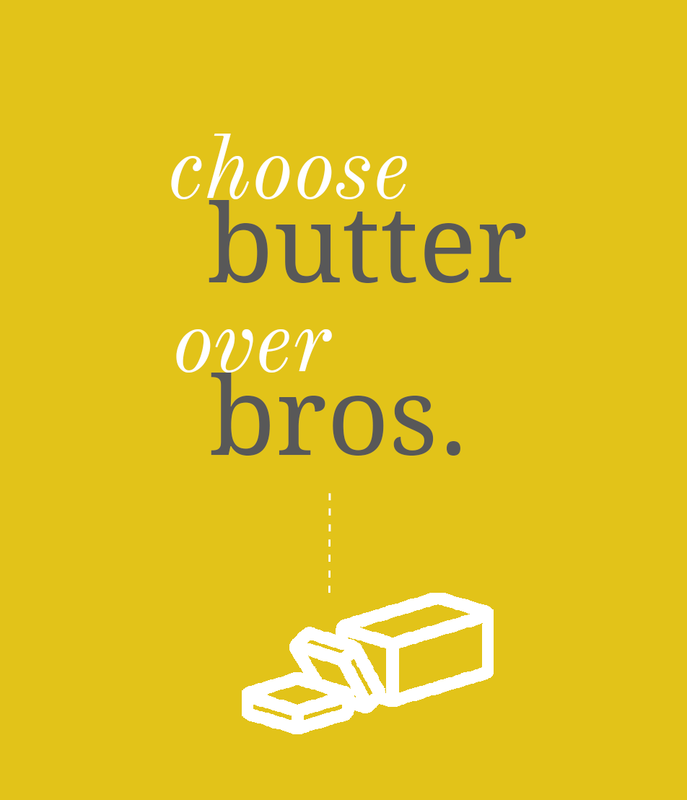 Random Sides // Choose Butter Over Bros. Sometimes I really love playing around in Photoshop and Illustrator. I’m no graphic designer, but I’ve got a soft spot for typography. Graphic design – for me – is very much like baking. It’s the perfect combination of utilizing my technical (left) brain along with my more creative (right) brain. Here’s one sample of something I’ve been up to lately. Of course I had to tribute my beloved butter. 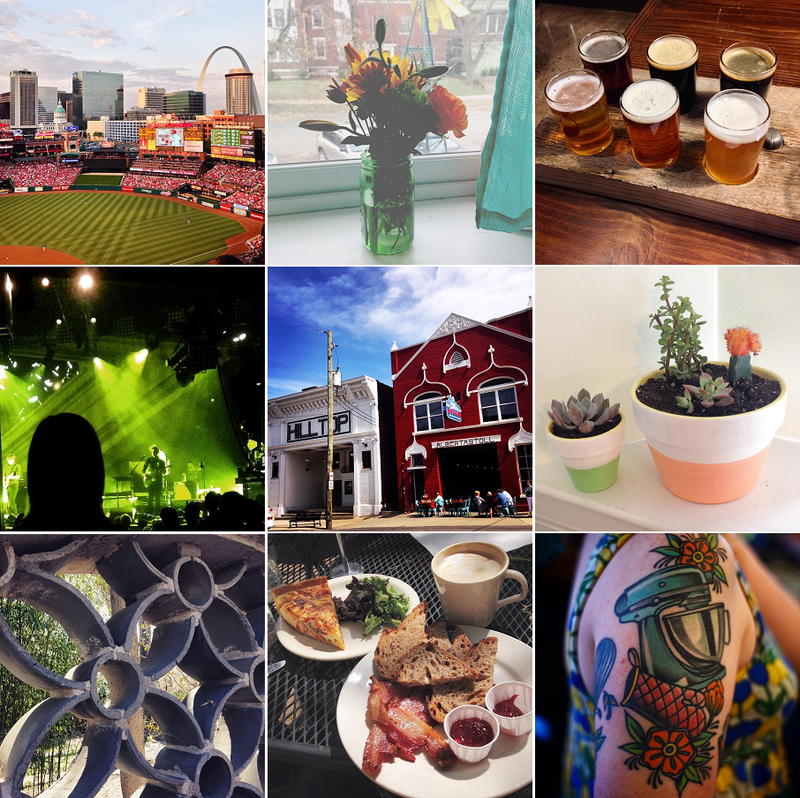 Random Sides // Cheers to 2016. I’m certain that I have mentioned before on this blog that I’ve never been big on New Years’ Resolutions. Last year, I actually did write some out [see them here if you’re so inclined]. But what I am finding as the years roll on is that – more than anything else – things change. When it came to my 2015 goals, I did achieve some of them… But most of them just got altered or forgotten about in some way. 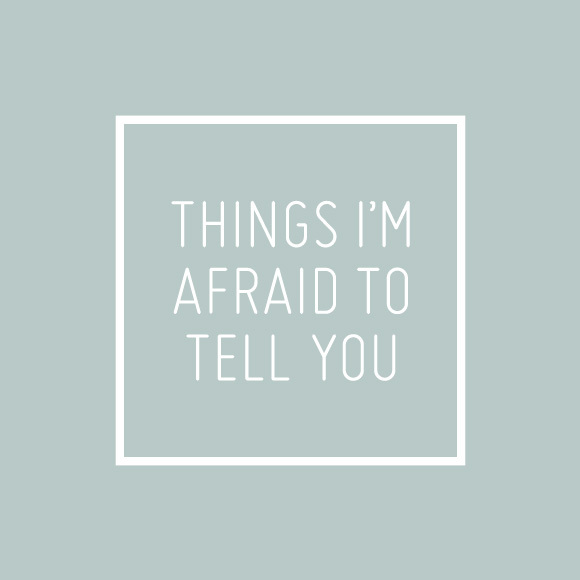 Of course, some of that is on me – my issues, my tendency to be lazy about some things, my flaws and shortcomings – but it’s also just because so many things changed in 2015. 2015 had a lot of ups and downs, just like every other year, however, many aspects of my life just changed so, so much. That’s why I have decided to take a slightly different [perhaps more sustainable?] approach to my goals for 2016. Instead of creating new, concrete goals, I have decided to make a list of things that I want to continuously work on improving throughout this year. While it’s always lovely to have that sort of “mental reboot” that a new year brings about, I also think it’s important to create sustainable practices for a better life. Mostly, I want to just continue focusing on improving who I am as a human, with a huge portion of that focus on self-care. My thoughts are below. Eat a more “clean” diet. My diet is fairly healthy and well-balanced, all things considered. Still, I have my vices, and I could work to eat more cleanly. To do this, I’m trying to incorporate more simple, whole foods into my diet (e.g. more fruits/veggies, less artificial/refined sugars, etc). I also really need to quit being such a slacker when it comes to breakfast! Why is it the “most important meal of the day,” yet also the one that’s the hardest with which to maintain a dang routine?! Here’s to hoping some tasty green smoothies will be my savior in the mornings [and no, a cup of coffee is not an acceptable breakfast]. Get back into yoga. I was doing pretty well with attending yoga classes last year, but my budget had a major hiccup, and sadly, my [not the cheapest] yoga classes had to go first with my budget cuts. However, this year I’m doing better financially, and I am going to start attending classes again twice per week. I’d also like to work to build a yoga practice at home, but I’m not in a huge rush with that just yet. Try a few new fitness activities. Even if I decide I hate spinning, it never hurts to try something new. It’s important to stay active, and I’m more of a “try to stay active and let the rest work itself out” type of person than I will ever be a gym rat. 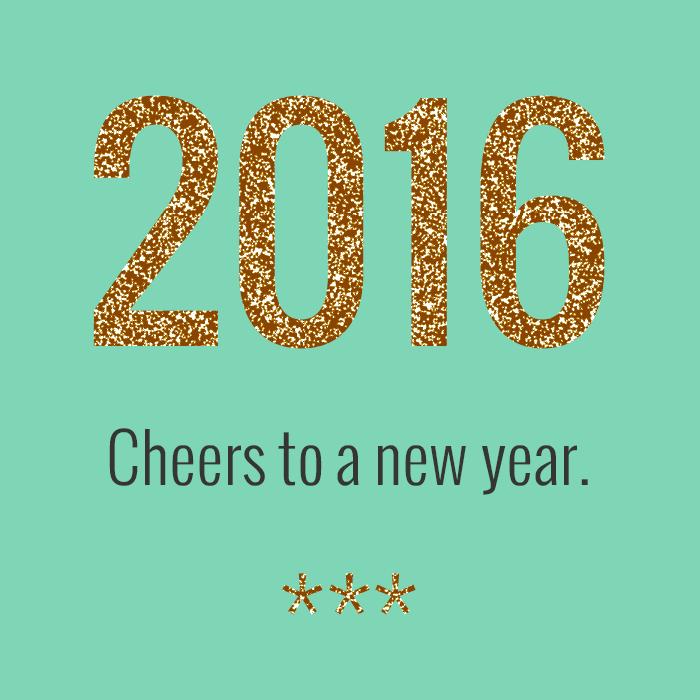 My goal for 2016 is to try at least one new fitness class, just for the heck of it. First on the list is a spinning/pedaling class, as soon as I have the budget for a class card [for those who care, this will probably be at some point in February]. Read more books. I’m not sure if I want to set a specific number of books to be read, but I do need to make the goal somewhat more concrete. “read more books” could mean reading two books throughout the entire year, and that seems silly. For now, I’ll simply make it my goal to read at least one book per month. That seems doable; it’s a good way for me to relax, learn more, and to not rip my hair out trying to accomplish too much. 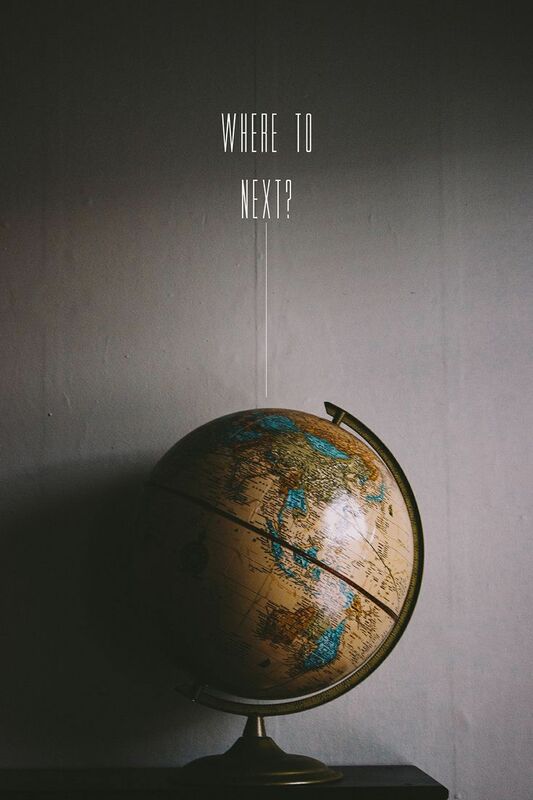 Travel more within the U.S., as time and budget allow. As far as “TREAT YOSELF” activities are concerned, I have decided that 2016 is the year for tattoos and domestic travel. I’m in the process of [slowly] planning another international trip for 2017 (sup, Ireland?! ), but for now, I need to focus my traveling shenanigans to right here in the good ol’ U.S.A. There is still so much of this gigantic country that I’ve never seen, so here’s to enjoying the culture right here at home. Build more confidence in myself and continue on my quest to radically love myself and who I am/who I’m becoming. A manager recently told me, “You have serious talent, and so much potential, and I can tell you’re very intelligent. We just need to figure out how to get you to tap into it.” Self-love is tough for me, especially with managing depression/anxiety. But I know that I (and you, too!) have the potential to do so much more, if only I’d just believe it. I have spent far too long doubting and hating myself, so 2016 is the year in which I really get into lazer focus mode when it comes to my mental well-being. Cultivate existing friendships and be a better friend to others. Friendship is, of course, a two-way street. I’m also one of those people who is a little too inwardly focused, especially as someone who leans far more toward the introverted end of the personality spectrum. But this year, I’m trying to work on existing friendships and continue being a better friend. I have a feeling that I (very unintentionally) come off as a bit of an a-hole sometimes when I neglect friendships, so I’m working on being there for the people who have proven themselves loyal friends. Small things even make a huge difference: such as just making sure people get home safely, checking in on people to see how they’re doing mentally, etc. Aight, whew. That was a novel…So let’s discuss. How do you feel about goals and resolutions? Did you set any for this year, or do you think new years’ resolutions are for the birds? Random Sides // Merry Christmas! Just wanted to take the time to say MERRY CHRISTMAS! 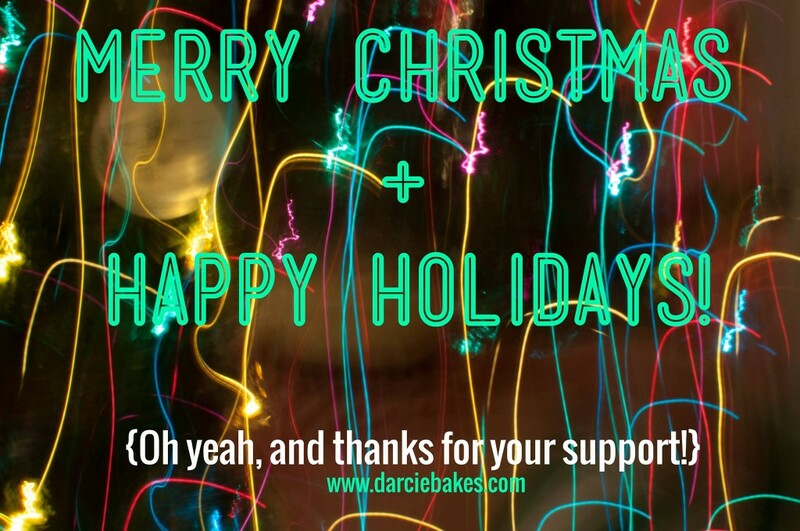 And, as always, for those of you who actually follow me… Thanks for your support. I hope you’re all enjoying the holidays and having a wonderful, safe, relaxed time with your loved ones. MAKING A to-do list for all the stuff I have to get done in the next three days. COOKING Nothing today, but I am making chicken/broccoli/quinoa casserole tomorrow. It’s so delicious. I’m also making some boozy brownies. Yesssssss. DRINKING Water + Arnold Palmer iced tea from Whole Foods. READING Nothing at the moment. I purchased a copy of Alice in Wonderland from Anthropologie around Christmas time. It’s one of those books with the gorgeous covers on it. I should probably get on reading it soon. WANTING I want many things. I need to learn to want less. PLAYING No music right now. 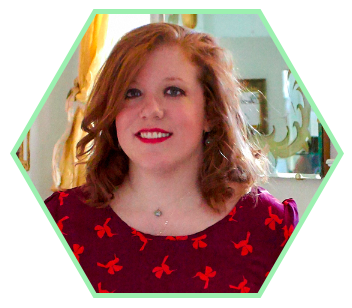 I’m on an all day online training session for work [this blog post is a break from staring at a screen and listening to someone talk for six hours]. WASTING Nothing? I try to not waste too much. SEWING Lulz, I can’t sew. WISHING That I could be done with my day job so I can go do other things. Story of my life? Haha. Story of everyone’s life. ENJOYING My hair. I bought some new Herbal Essences Naturals shampoo, and my hair is so soft and silky smooth! Ha. LIKING My new role at work. I am on a great team and my work is pretty fulfilling. WONDERING How I’m going to get everything done before I take a mini-vacation to Tennessee. LOVING This black cherry yogurt from Whole Foods. It’s converted me to actually tolerating yogurt! HOPING That the brownies I’m going to make tomorrow turn out well. MARVELING At how amazing it’s been to do more volunteer work as of late. NEEDING More water. I’m developing a bit of a headache. WEARING Black skinny pants, black Tieks flats, a multi-colored, flowy top, and a light green cardigan. 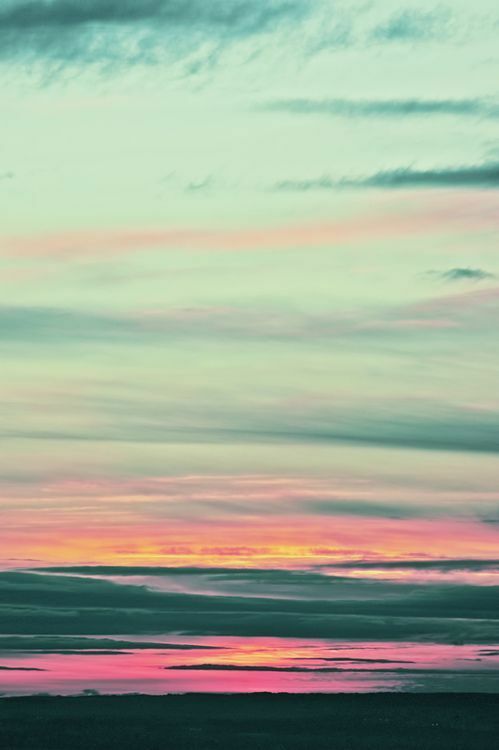 FOLLOWING My heart. Or at least I attempt to find a balance between my head and my heart. NOTICING That my contacts are starting to get dried out. Argh. KNOWING That everything is going to turn out just fine, and possibly even better than expected. THINKING I’m currently thinking about agile project management concepts and how they relate to Microsoft Team Foundation Server [IT nerd probz, haha]. BOOKMARKING Several articles on privacy in the digital age. I’m in the very beginning stages of collaborating on a published paper with one of my former undergrad instructors. OPENING My bottle of water. GIGGLING At my friends. Always. They usually have a way of making me laugh. 01. As I’ve mentioned, I spent two weeks in Germany and other parts of Europe back in June. This is a picture from one of the information security classes I took in Deutschland. 02. The lookout towers in the forest preserves in the Czech Republic are way cooler than ours! 03. In keeping with my new tradition, again I gave some baked goodies to some fellow STL foodies that I met IRL [in real life]. This time I made browned butter chocolate chip cookies for Christine and Kate. They loved my cute little pink bakery boxes, the emoji stickers, and my custom-made Darcie Bakes stamp! Hooray. 01. I saw so many pretty little gardens throughout the small town of Deggendorf, Germany. 02. These “Live Free, or Chai Trying” growlers are at a local STL brunch place called The Mud House. The Mud House is awesome and I really want one of these growlers, just cuz. 03. The Lantern Festival at the beautiful Missouri Botanical Gardens was a fun sight to see. It’s true. Baking is my love language. What does that mean? Well, there’s a theory out there that says we all show love and affection to others – whether it be romantic or platonic or familial – in a particular way, that is unique to us. The five “love languages” are as follows: words of affirmation, acts of service, receiving gifts, quality time, and physical touch… Or something like that. Of course, we all have a combination of the five love languages in how we interact with our loved ones. However, we all lean toward one way or another. It’s been awhile since I have taken a quiz on love languages, so I can’t even remember what categories I fall under the most. Anyway. It’s pretty interesting to read about, and I think it can be helpful to learn about when it comes to our relationships. It’s a good way to understand our own needs, as well as our loved ones’ needs, and how we show love and vice versa. That being said, I always like to say that baking is my love language. Random Sides // I’m Going to Germany! I haven’t talked about this on the blog yet. But you read the title right: I’m going to Germany! I’ve never been out of the continental U.S. [nope, not even to Mexico or Canada! ], so this will definitely be a new adventure for me. Like most great adventures, the opportunity for the trip kinda came out of nowhere. At the beginning of 2015, one of my undergraduate instructors invited some other alumni and me to attend a study abroad program in Germany this summer. So, I’m going to an IT security seminar at a university in Deggendorf, Germany. On the days in which we’re not required to be at the seminar, I’ll have time to myself. My instructor has scheduled some touristy activities for us to do, and then I’ll find some of my own adventures on the other days. I’m flying from Chicago to Dublin to Munich, and I’ll be in and around Munich for a few weeks. 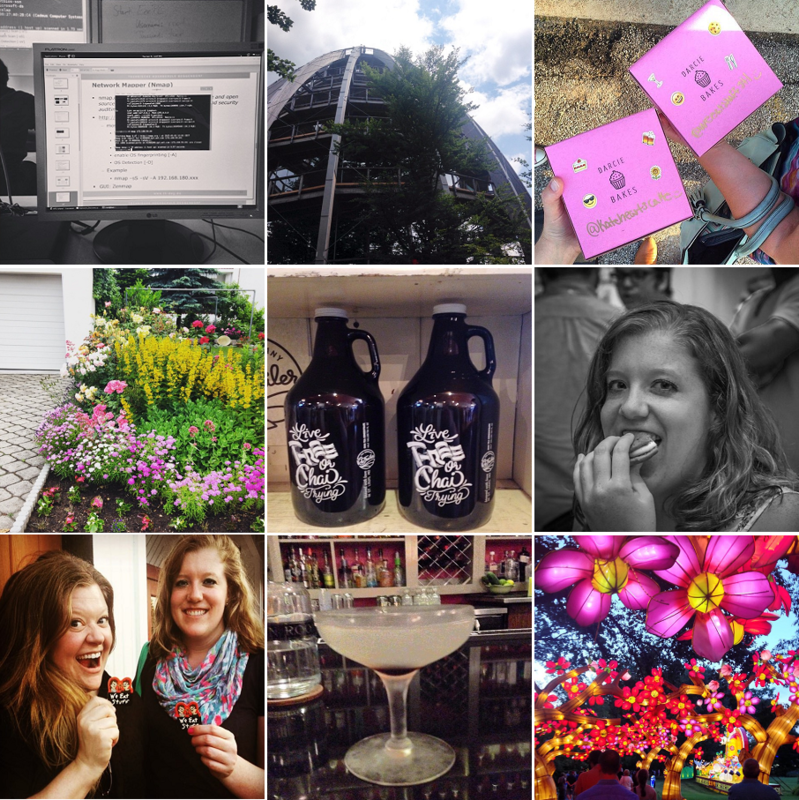 That’s all I want to share for now; I need to finish packing and organizing blog posts! I am trying to schedule some blog posts ahead of time so that my regular schedule doesn’t get too thrown off. In the meantime, I’m getting super anxious about my first international trip! I’m certain that it will be amazing, but I am definitely nervous. You’ll be seeing regularly scheduled posts from me, plus a few updates on the trip every now and then. I’m going to do my best to take a lot of awesome photos while I’m in Germany. I have been quite busy as of late, but I gotta say that the past several months have been pretty glorious [for the most part]. 1. Take everything one step at a time. ONE. STEP. AT. A. TIME. Doing so will greatly reduce your anxiety levels. Just calm down. Everything will sort itself out in due time. 3. Yoga is good for you. DO IT MORE OFTEN. Preferably erryday. 02. Some pretty flowers sittin’ in my bedroom window sill. I love buying fresh bouquets when I have the chance. They always cheer me up. 03. I enjoyed a beer flight at a brewery in northern Illinois about a month ago. I love beer! 01. I had the privilege of seeing one of my favorite bands for the second time – Death Cab for Cutie. They are always great live, and I would go see them again whenever they’re in STL again. 02. Some of my friends are from Louisville, Kentucky, so we recently took a little road trip over there. It has a lot of similarities to St. Louis. The architecture is pretty similar. Me likey. 03. I got the idea to paint some plain terra cotta pots with acrylic paints to give them a color block effect. Then I planted succulents in them. I love them! 01. Finally, I got a membership for the Missouri Botanical Gardens (aka MOBOT). This is one of the neat concrete walls in the Japanese garden. If you’re ever visiting the Lou, definitely check out the gardens. They’re super pretty and relatively cheap to visit! 02. I loooove brunch, but I think most people do. The Mud House on Cherokee St. is amazing. Mmm. Random Sides // Some Life Lessons as of Late. Well, that’s how I’ve been feeling lately. Life lessons tend to stick better at some times than others. Lately, I’ve been practicing quite a bit of yoga and meditation, as well as self-hypnosis [not as whack as it sounds without context]. I think that, for me personally, all of these activities have been working wonders on both my mental and physical health. Of course, it’s not that simple. Depression and anxiety are serious issues, and you can definitely not just “will them away.” That being said, there is power in knowing that if your brain can get you into something, it can also get you out of (or to the opposite/reverse of) something. Okay, all of that rambling aside, here’s a trusty bulleted list of some thangs that have been stickin’ in my thick skull as of late. I hope you find them helpful. + There is almost always a way around [or out of] everything. If you fall into any problem, there is pretty much always some kind of solution. It may take a lot of time and effort, but as my parents always told me, “If there’s a will, there’s a way.” If my brain has gotten me into a really bad depressive episode, or if I’m really anxious, there are [positive] ways to reverse the issue. I’m one of those lucky people who is most likely going to deal with depression for the rest of my life. But there are always ways to improve it, as well as to prevent the worst of it. + Yoga is probably the best thing ever [after beer and chocolate, of course! ha!]. It works really well for me, so of course it’s easy for me to tout its benefits. It is not for everyone, obviously, as no one thing works for every single person on the planet. However, its benefits are just endless to me. I’ve been back on the mat and attending basic classes again [at Urban Breath Yoga, just FYI] for the past month or so, and I’m kicking myself for not having done it sooner! It is very important to find the right studio and instructor(s) for you, if you plan on doing it. Personally, I lucked out, as I have fallen in love with the first studio I (very nervously) tried out in St. Louis. Anyway, enough rambling. Here are some of my favorite benefits of yoga: it improves mental and physical health; it always reduces my anxiety; it improves posture, as well as digestion, and it just makes me feel good. + As my yoga instructor said tonight, “In everything we do – sitting at a desk, driving a car, etc. – we are always leaning forward. That’s how we end up getting hunched over and having poor posture. Always keep your shoulders back and tall; reverse the aging process! Keep them back there where they are supposed to be!” That really stuck with me. I sit at a desk all day for work, and I definitely do not have great posture (I also have scoliosis, so that doesn’t help). But when you’re standing line, sitting at a desk, sitting on the couch, working in the kitchen, what have you… Try to stand up tall, and keep your shoulders back and away from their tendency to get close to your neck. + And finally, I just wanted to write this, because it’s what I keep reminding myself of all the time: Good things take time. People are mostly baffled by my from-scratch baking/cooking shenanigans, because, and I quote, “That sounds like too much time and work!” Well, yeah, baking does take extra time and effort than using a box mix, or just going to the store to buy a treat. But you know what? The end result is far more worth-it, and that’s partially why I love baking from scratch! Because good things take time! Good relationships, good careers, good physical fitness… It all takes time.